The Humvee is proto typed 79'-81' and was sent to uncle sam for testing in 83' 50K units got order and started production in 85' - present. Now giving AM-General was the Commercial/Military division of jeep, AM-General was sold off slightly after/before the Contract for production. 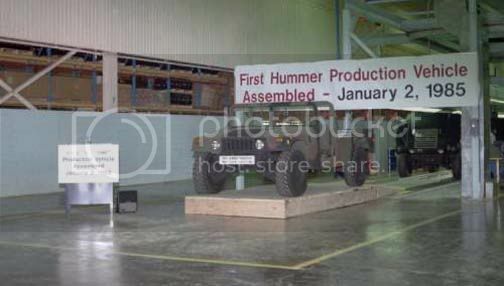 So why couldn't Chrysler/Jeep of picked up the Hummer line reuniting Jeep & hummer Just a thought ? ? ? I get what your saying, But I wasn't so much saying Chrysler as much as I ment Jeep should merge in/with AM-General. AM-General sold them the Jeep designs in 83' and the larger truck designs in 93' . . . AM General started the M900 series 5tons and A3 series 2.5tons from 83'- 99'. Then small batch of exported A3s in 01' Then AM-G gave up the Medium & Heavy trucks. They've done a pretty decent job with all that too. AM-G has been mass producing Humvees since 85'-present, But they have done more then Military vehicles . . . They made "Grey hound" style buses for a number of years, they built trams n trolleys for a while, They produced some handy capped wheel chair taxis, and are now assembling Fords fully electric connect vans . . .
KIA Motors seems to doing everything from tiny lil'clown cars to 75K-LB GVW all wheel drive trucks, Their "715" aka KM450 is diesel powered ! ! ! Kaiser used the 230 I6 and AM-General used the 258 I6 Kia uses a diesel ! ! ! AMC-401/AM-TH400/IS AMC-20 (Prototype only) to GM 6.2-NA/TH400/IS AMC-20 to GM6.5-NA/3L80/IS AMC-20 to GM 6.5-T/4L80E/IS AMC-20 to AM-G 6500/AM-G 4L80E/IS AMG-20 to AM-G 6500/AM-G 1200/AMG-20. expanded payload/towed loaded Capacities to minor n major body restyling. 6.5-NA/3L80/AM-20 to 6.5-T/4L80E/AM-20 to D-Max/4L85E-Alison/AM-20. Sharing common chassie/power train/axles plate forms of product vehicles. Roof line alteration: brows n brow less. I guess when broken down, All 3 Rigs differed greatly . . . So not an FSJ ! ! ! Did they really put a AMC 401 in the prototype? That would be cooler than xxxx! Love to see some pics of that! The 79'-81' Prototype's were powered by a heavy duty version of AMC's 401 V8 engine, Turbo hydromatic 400 transmission, Spicer transfer case, and was equipped the all new independent suspension Model 20 which were made from case aluminum. The powerful but inefficient AMC V8 wasn't producing enough vehicle range to meet military specifications. The vehicle had some stability concerns. vehicle was expanded into the "Humvee" we know to this day. AM General decided to power this new "humvee" with the all new GM-6.2L diesel engine. This Vehicle was sent to the US Armed forces for testing and evaluation, A contract was signed for 55,000 units by 1985 AM General rolled the first of many humvees off the assembly line. Interesting, I wonder what they did with a 401 to make it any more HD than it was OEM? Maybe add 4 bolt main caps... but beyond that.... ? I can definately understand the concerns about the range of a 401. 215hp n 320tq / 255hp 335tq they listed a third at 235hp / ?? ?tq the torque was plank. I figure it was the 235hp or 255hp engines ? . . ? Now 71' it made 330hp n 430tq ? ? ? Last edited by AMC-390DRW on Wed Feb 09, 2011 7:43 pm, edited 1 time in total. I'm trying to find were that blurb is that I quoted was, I knew I should of book marked it . . . Ya the AM-General site seemed to have gloss over its history just a general summary from 1903 - present day they had the photos on there but they showed up rather small. 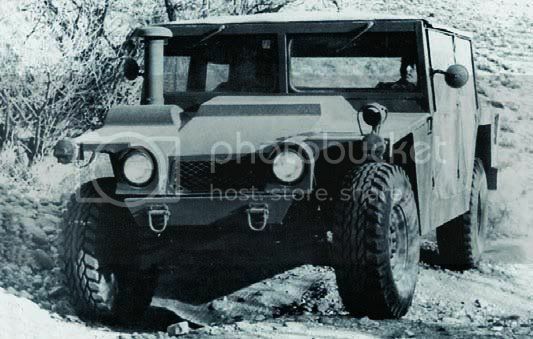 So a searched 1979 Humvee prototypes, I came up with the larger photos and that little blurb about its beginnings. I thought it was kind of cool as it referred to AM-General as "American Motors General" . . . I miss my computer ! ! ! I been using my phone for the last 2 or 3 months and searches n linking via blackberry test ones nerve ! ! !